If you follow live music for any length of time you begin to hear about venues almost as much as you hear about bands. In reverent tones people talk of places the show-gower must go to. Places “you gotta see…” Their names become burned into our collective consciousness. Long before we see them, or step foot onto their hallowed grounds we feel we already know these places somehow. 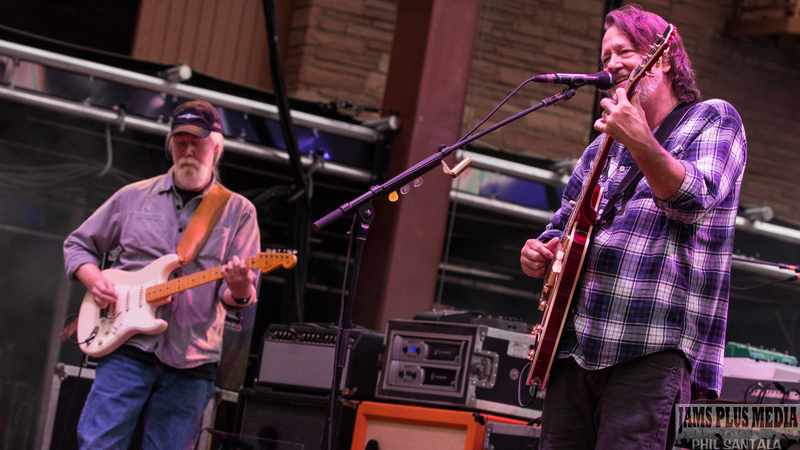 SPAC, The Gorge, Merriweather Post, Alpine Valley, The Greek, The Fillmore…Years of seeing their names on mp3’s, burned CDs, and even hand written onto cassette tapes has linked us to these mythical places. 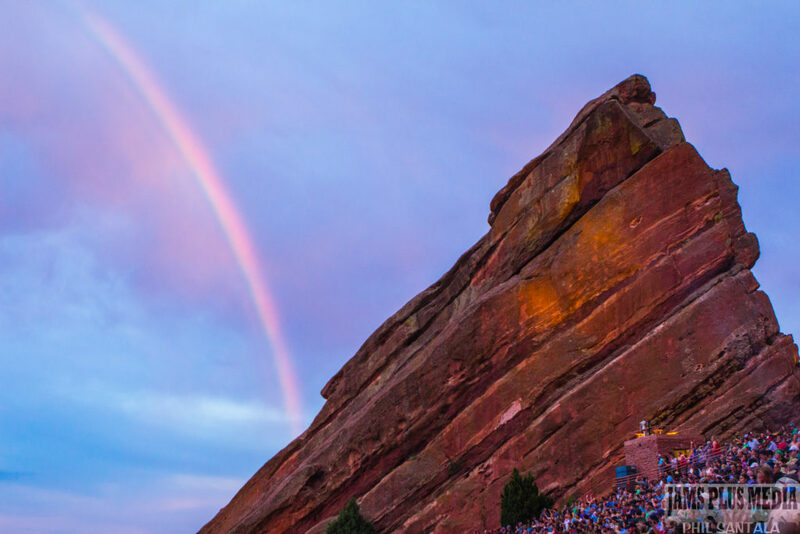 Red Rocks has its permanent place in our collective consciousness. We heard about The Grateful Dead’s 4 shows in 1978, Phish’s fan based “riot” in 1996 in nearby Morrison, and then there’s Widespread Panic’s storied history. 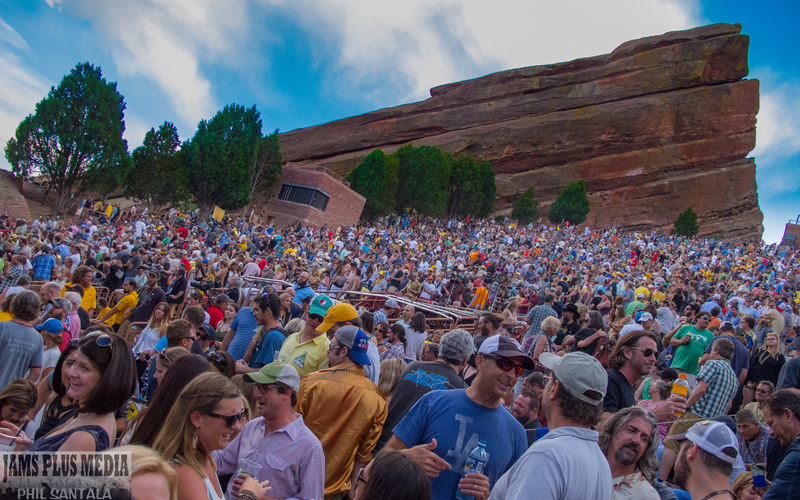 A few years back I covered the 50th Widespread Panic show at Red Rocks, but this year’s run marks an even bigger anniversary: Widespread Panic’s Golden Anniversary show as a sold out headliner. Their 50th sold out Showversary! Before the band even took the stage the event posters alone highlighted the uniqueness of this event. For the first time three artists collerberted to create three posters that link together. The posters tell the tale of the evolution of a community. 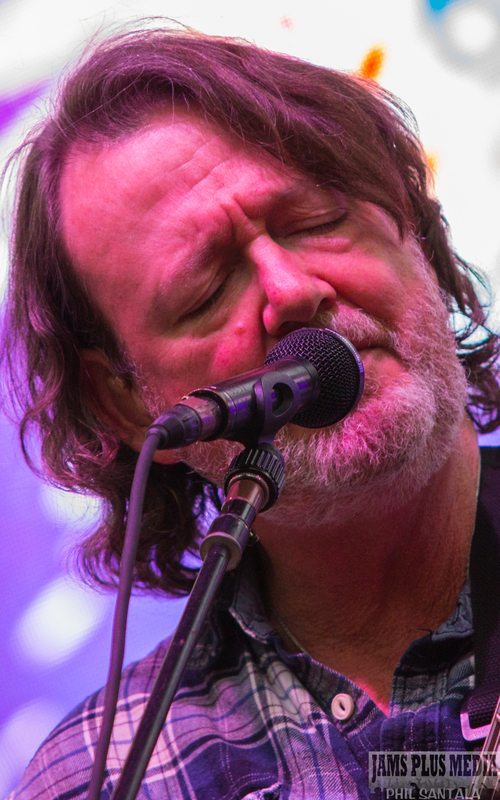 In some ways during the last 51 soldout shows Widespread Panic has done the same thing. 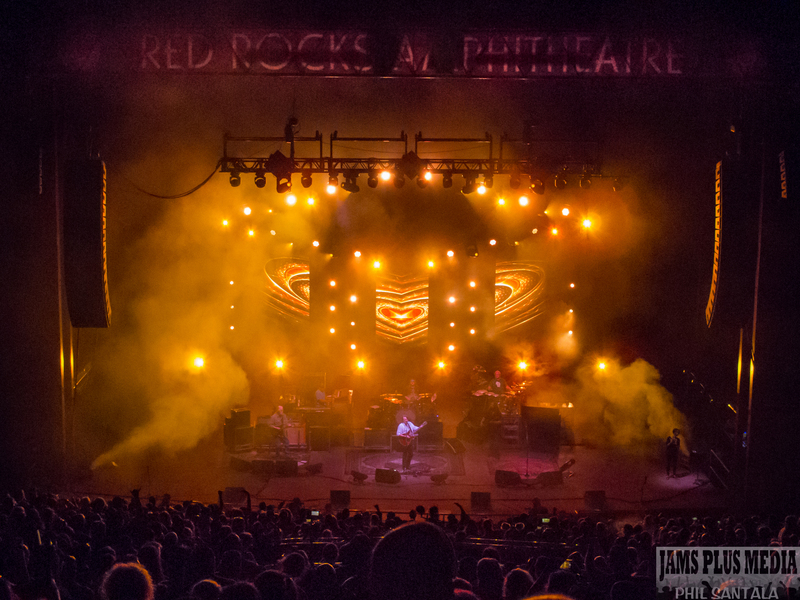 They’ve built an ethos and lore wrapped around places like Red Rocks. And like most great things it was built upon humble beginnings. 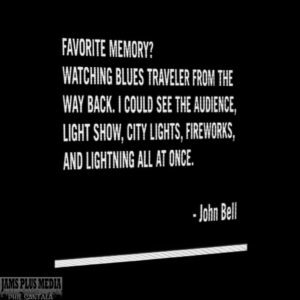 John Bell’s favorite memory of Red Rocks: watching the fireworks during Blue’s Travelers set during their 1st appearance (as an opening band) at Red Rocks. Friday’s show would feature fireworks of a different kind. The “Happy> Airplane> Rebirtha” jam in the first set began to give the crowd a little room to fly. Opening the second set was the Buffalo Springfield cover “For What it’s Worth”. This cover has been rapidly working its way back into rotation since it’s bust out in 2011. John Bell’s chops work nicely on this piece, and it hard to see why it had previously been shelved since ‘88. With the passing of Bernie Worell on Friday it was a likely thought there would be some nod to the keyboard great. Bernie was a founding member of Parliament Funkadelic and an integral part of the Talking Heads. “Red Hot Mama” would not disappoint. Smoking in at just over 7 minutes long it capped a rocking second set. “1×1” took us slowly into the encore. A recent shift has the song being introed by a slow keyboard melody, almost at ½ tempo, before building the steam as the song picks up pace. It’s an interesting transition and provides some added depth to the short ballad. Saturday was notable right out of the gate. You would have had to have been living under a red rock not to notice the numbers lining up. Hell, you’d had to have not even looked at the jumbo-screen during set-break or before the show. 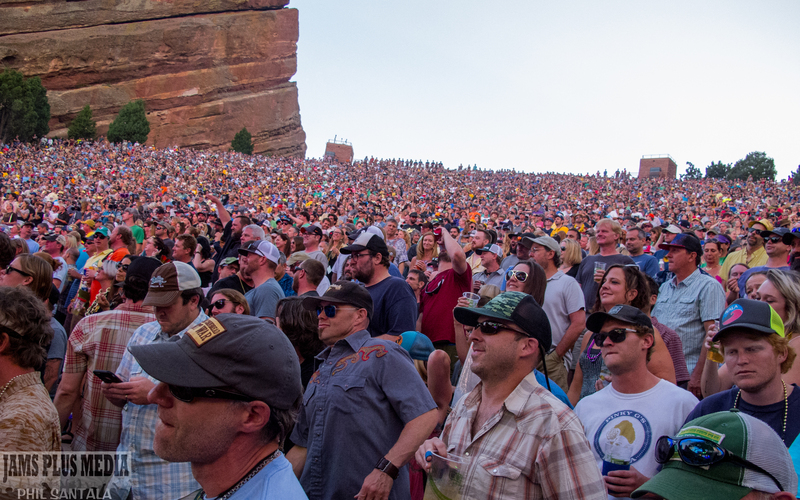 Quotes from band members and pictures of them playing Red Rocks over the years were displayed bringing back memories from the last 20 years of sold out shows. Saturday’s second set would have jams in spades as well. The obligatory Saturday “Henry Parsons Died” was the jump off point. Coming out of that song the band wouldn’t stop until the end of the set. “Pilgrims > Driving Song > Papa’s Home > Chilly Water > Cease Fire > Driving Song > Arleen > Chilly Water” was exactly what it looks like: a godzilla of a jam. The Driving Song split was poetic, but it was the Arleen (with Steve Lopez on percussion) where Dave Schools and JB demonstrated some old-school Panic action. The vocal improvisation during the rap in Alreen bounced back and forth between the two. It was reminiscent of a 1996 sit and ski Alreen in Breckenridge, CO. Edie Jackson, bless her heart, was a sight to watch as she struggled to keep pace signing along with Dave and JB. Speaking of Edie, JB would dedicate the encore opener “Dream Song” to her. Maybe because it’s slow, maybe because it’s personally relevant to her, or maybe just because it’s beautiful. Whatever the reason, it was sublime. For a early 90’s tune Dream Song has been played sparsely, just under 200 times. Retired from ‘01 untill ‘05 it really demonstrates Widespreads’ and JB’s range. It’s easily one of the most consistently goosebump producing songs played these days. It’s placement is almost always as an encore slot where it works o-so-well. Neil Young’s “Heart of Gold” picked up the tempo smoothly coming out of Dream Song. It served as an appropriate bridge before the flat out power ballad of Jerry Joseph’s “North.” “Heart of Gold” was also the band’s clear nod to to the last 50 sold out shows. But while 50 sold out shows is a milestone, there was Sunday’s 51st one to go. Sunday shows are notorious for being two things: a tough show to make, and a great one to see. Some people surmise that “never miss a Sunday show” was coined as an catchphrase to celebrate the difficulty Panic fans can have with the 4PM show time. It’s almost always hot, sleep has been cut short (or ruled out all together) and did I mention: it’s hot! But for your efforts you are definitely rewarded. “The Take Out> Blackout Blues” may have been the band’s homage to their die-hard fans who managed to play thru. 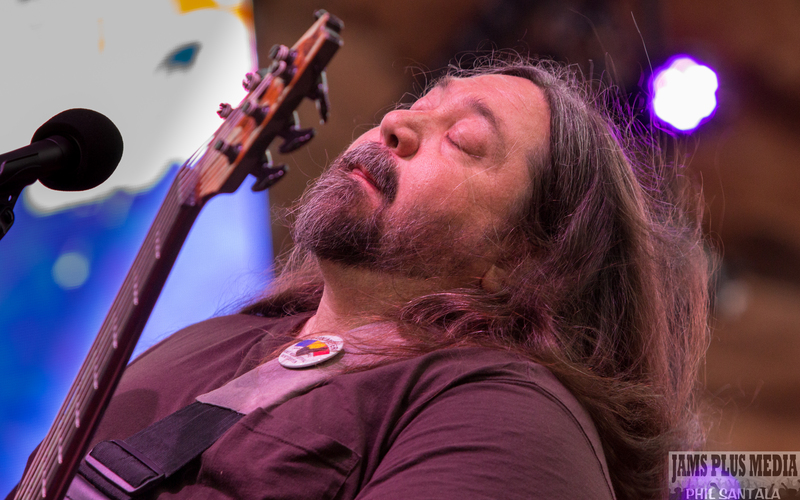 The Hot Tuna cover “Genesis” kept us collective looking towards the future while remembering the past. “Up All Night” was well received by the collective masses gathering their second wind. As the song progressed we finally caught a break. Our heads started spinning just a little bit less as the shade started to encompass the masses while the sun slipped down behind Ship Rock. Finally, some shade from those sunny rocks. The second set featured an eclectic mix of originals and covers. “Ophelia> The Shape I’m In” was a solid grouping of The Band covers. It was vaguely reminiscent of 2014’s run here when the band lumped the same segway together, but also tacked on “Chest Fever.” That year featured most covers being done in a 3 song group. This year the covers were peppered in. While “Time is Free” is likely known to most panic fans as a Col. Bruce standard (or Stained Souls/Bar Tab to more refined fans) it is a 70’s original by David Earl Johnson. It is also a great springboard for the the band to jam. This includes JB’s vocal improvisational skills as well. The slow winding musical improv was a treat to the collective sun-scorched brains of those in attendance. It was also a perfect pairing to Traffic’s “Low Spark of High Heeled Boys.” The crowd participation with the “Yee-Haws” during “Love Tractor” was all time, to say the least, and showed that the fans were ready and willing to rock out just a little bit more. JB eased the fans back into the encore again, like he had Saturday night. In its 5th rendition ever as a cover by Widespread Panic the late Jeff Buckley’s “Hallelujah” dips into those same beautile pipes as “Dream Song”. John Bell absolutely crushes the vocals on this song, in a very good way. Words cannot describe how well this tune fits his personal styling. 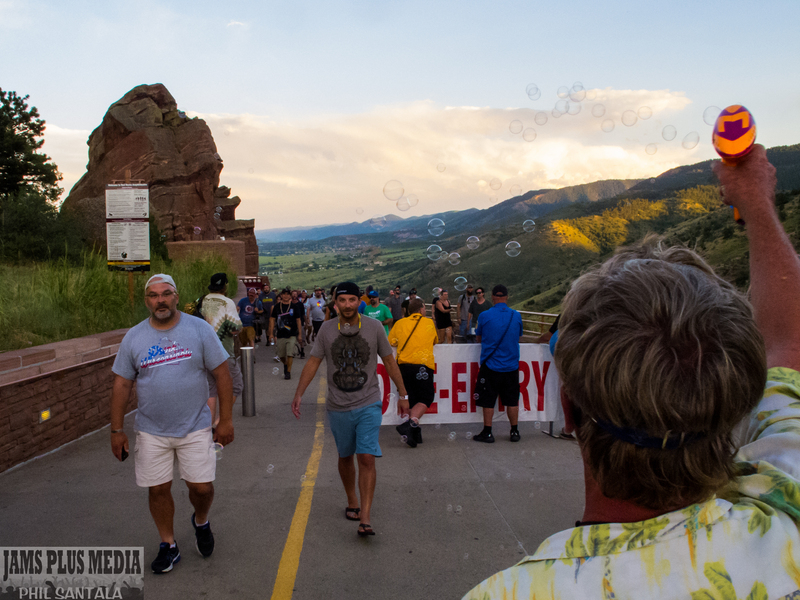 Sunday Panic at Red Rocks has always been a spiritual event for many in attendance. It’s our church, and it’s the one we look forward to attending once a year! Not only do we look forward to it, but we never, ever want to leave, which is why “Postcard” brought down the house. From standing and swaying, to rocking and rolling in just a few chords. The fans, and the band, brought it all home. 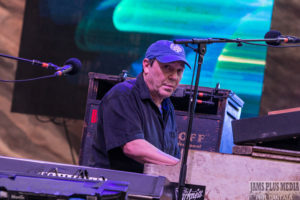 JB had thanked the crowd for making “this whole world possible for us” before the encore, and i’d like to think our collective energy during “Postcard” and “Porch Song” thanked him right back. One can’t help but look back on the storied history of the last 51 sold-out shows. In the 55 total shows they played at Red Rocks Panic has sold out the last 51 of them. From the 45 minute sets as a Horde opening act…to spending almost the same length of time playing a single encore. They’ve played sets which song was an original from the same album, to sets which were composed entirely of covers. New songs like Dark Bar have made their initial appearance here and old favorites have been unshelved after years of absence. 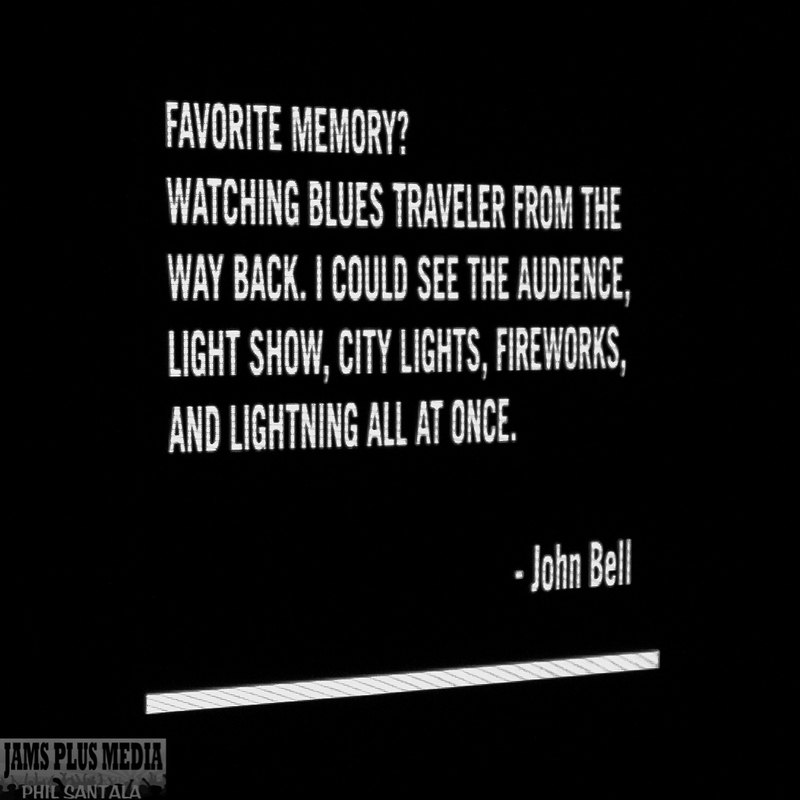 Anyone who’s ever been in attendance for a three night run walks away with dozens of stories to tell and memories to last a lifetime. Special guests have too numerous to even count. Staples over the years have included the Dirty Dozen Brass Band and Jerry Joseph. It’s played host to the late, great, beloved Michael “Mikey” Houser’s second to last show, and his last multi-night run with the band in 2002. 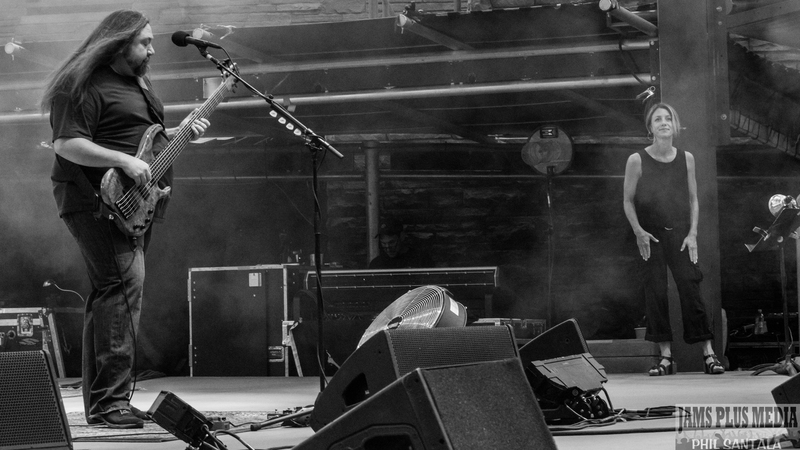 I’d like to think that Red Rocks was set to be his last, but the energy it exudes carried him through to Iowa. Still this band in its fans didn’t get to where they were at by just looking back. 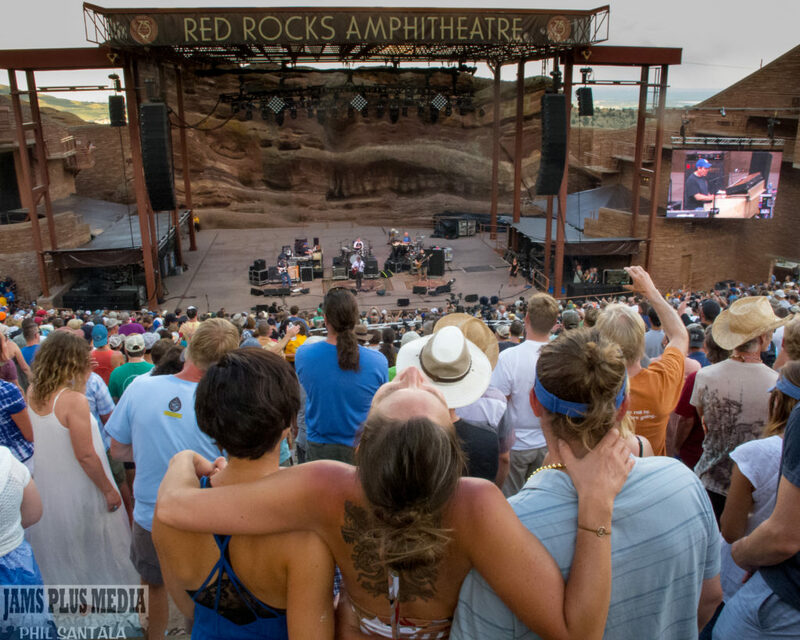 To paraphrase Dave School’s Red Rocks quote: here’s to 49 more… Cheers! 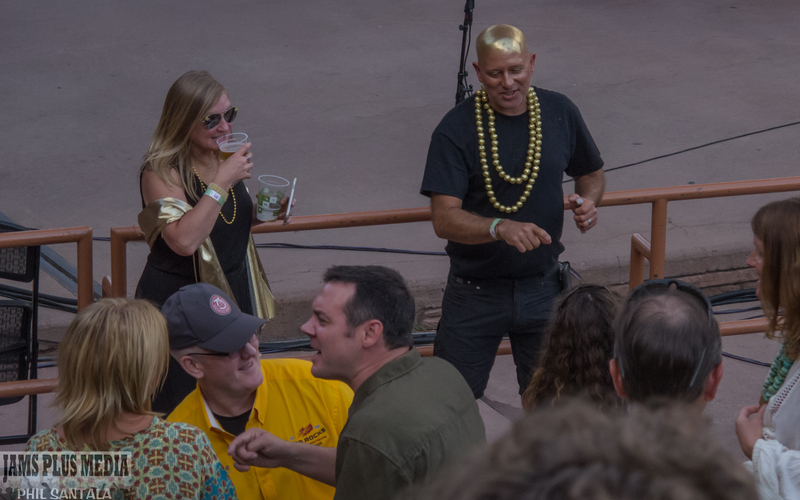 (Writer’s Note: It was actually the bands 52nd-54th time playing Red Rocks. Click on the highlighted text for a WRITE UP of their 50th show and PHOTOS FROM the same. Thanks!